It is indeed a beautiful time of year. The trees have burst back to life, flowers are blooming, the birds are singing, and Copper River salmon are readily available (at least here in the Northwest). 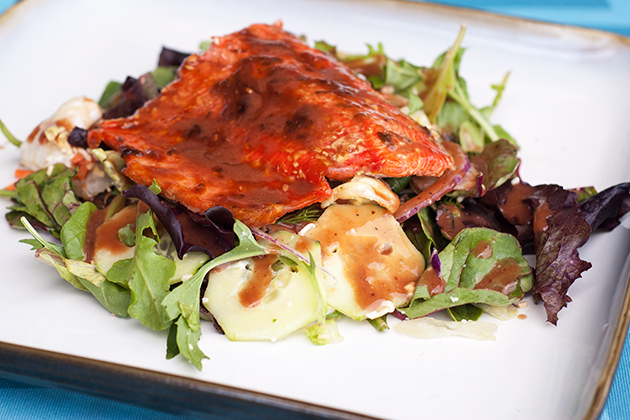 It just so happens that salmon can be easy to cook and it's great on a salad for a light meal. Those of you who have been following this culinary adventure from the early days may remember my Slammin' Salmon recipe. Well, as I alluded to, it's that time of year when the glorious Copper River salmon are waiting for we salmon lovers to have our way with them. Rather than an exhaustive recipe, this is just intended to be a source of inspiration. Tonight I plank-grilled a beautiful fresh Copper River salmon filet according to the previously mentioned recipe. I then let it cool, and laid a portion of it atop a significant bed of Spring greens and baby spinach with a little sliced cucumber and red onion. For the dressing I whisked some of the leftover salmon glaze into a basic balsamic vinaigrette to make an Asian-influenced cherry balsamic. The salty sweetness of the cherry and hoisin with the tangy balsamic make an outstanding dressing for this salad.